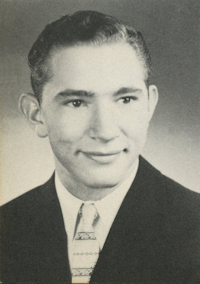 Obituary – Stieferman, Robert Eugene « Perry High School Alumni Association, Inc.
Robert Stieferman Sr. passed away in Tulsa, Oklahoma, Friday, June 13th at the age of 74. He was born October 31, 1939 in Perry, Oklahoma to Leo B. and Pauline Stieferman. He graduated from Perry High School in 1957. “Bob” was preceded in death by his wife and love of his life, Mary Ann (Wohlmuth) Stieferman. He worked as a machinist at McDonald Douglas for 28 years. He was best known for his contagious smile, gentle spirit, and his wonderful hugs. Bob was very active in his church and was a fourth degree Knight of Columbus. He will be greatly missed by his family and friends but we all know he is happy now to be back with his angelic wife. Services will be held at St. Pius X Church, Tulsa, Oklahoma. A Rosary will be held Monday, June 23rd at 7pm, and funeral Tuesday, June 24th at 11am.